Once more unto the breach, for the Third Edition of the All-Time SFF Sales List. The usual rules apply: these figures come from publishers, websites and the authors themselves, they may be for all books in print rather than sold (although this will only cause a big difference for authors at the tail end of the list) and they are certainly not all right up to date. The first 10 authors are listed here, the rest after the jump. Please note that the text of some entries remains unchanged since the 2013 list, as I wasn't going to rewrite every single one where no new information can be found. As previously, I am indebted to the contributors to this thread on Westeros.org who kept the figures rolling in over the past eighteen months. 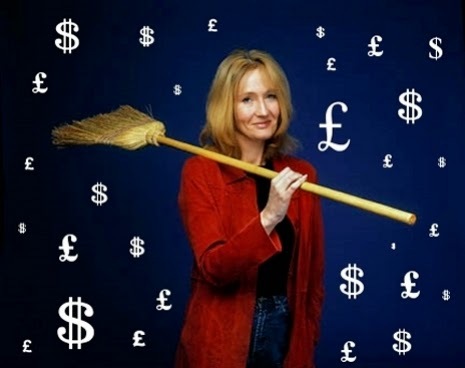 J.K. Rowling was SFF's only billionaire until she gave away most of her money to charity. The fact that the charity is named "Evil Despot Volcano Headquarters Ltd" should not be any cause for alarm. J.K. Rowling may have completed Harry Potter, but the series is still selling phenomenally well. Coupled with the success of her three adult novels (The Casual Vacancy, The Cuckoo's Calling and The Silkworm), her position at the top of the table is maintained. As said in The Encyclopedia of Fantasy (1996), King's worldwide sales are totally incalculable and the above figure remains fairly conservative. King has published a string of popular novels since 2008, so his sales are likely up, but by how much is anyone's guess. King's Dark Tower series has sold more than 30 million copies by itself, which would be enough to get into the Top Twenty comfortably even without his many other books. The Twilight series has sold an enormous amount of copies in just ten years on sale. An impressive achievement. The late Michael Crichton published 27 novels during his lifetime, selling more than 200 million copies. Only eight of those novels are SF, but these include most of his best-known and likely biggest-selling novels (including Jurassic Park, The Lost World, Sphere, Congo and The Andromeda Strain). His placement here is for comparative purposes and for those who consider him to be a genre author. Suzanne Collins's The Hunger Games hadn't even been published when I created the first list. The trilogy has been published in full, sold over 100 million copies (over 65 million in the USA alone) and generated three hit movies since then (with another incoming). Very impressive. On the first list, Jordan had a lower position based on the frequently-given figure of 44 million. That has since been boosted by an additional 12 million sales of The Gathering Storm and Towers of Midnight (and possibly early sales of A Memory of Light). However, since then it has been revealed that this 56 million figure is for the United States and Canada alone. When a series has been sold in more than 20 languages (as this has), the rule of thumb is that half of the total sales figures come from outside the USA. The UK alone has added sales of 5 million to the figure. As a result, worldwide sales of at least 80 million for Wheel of Time are credible, and significantly more than that is likely. Since assembling the previous list the 80 million figure has been confirmed (as on the low side of things) by one of Jordan's international publishers. Winning the prize for 'most improved sales' since the first list (when GRRM had only sold c. 5 million books), the sales of A Song of Ice and Fire have continued going through the roof. The books sold more than 9 million copies in 2011 alone. Though Martin's sales were starting to noticeably take off anyway in the mid-2000s, the main reason for the boost has been the remarkable success of the Game of Thrones TV series on HBO. Terry Brooks has sold over 30 million copies in the USA alone with his international sales boosting this massively. Expect to see a further jump when the new Shannara TV series arrives. Rick Riordan is the author of the Percy Jackson series, which has so far spawned two successful movie adaptation and driven renewed sales of the books. His 40 million sales are for the USA alone. What a difference a year (and a half) makes. Veronica Roth's sales have exploded from 4 million to 22 million since the previous list, no doubt due to the success of the movies based on her Divergent series of YA SF novels. Sherrilyn Kenyon is a prolific urban fantasy author who also publishers supernatural-tinged historical fantasy under the pen name Kinley MacGregor. She has over 30 million books in print in over 100 countries, most notably the Dark-Hunter supernatural series. Tad Williams had sold 30 million copies of his books, including the Memory, Sorrow and Thorn trilogy, the Otherland quartet, the Shadowmarch series and several stand-alones, by 2011. Expect the new Memory, Sorrow and Thorn sequel series to add a lot to that. Frank Herbert's Dune is the biggest-selling SF novel of all time, shifting 20 million copies by itself. I would hazard that most of the remaining 6 million copies are of the five other Dune novels as well. Ender's Game by itself has sold seven million copies. Card's other books, including the highly successful sequels and 'interquels' to Ender's Game have also sold extremely well. Eddings had sold more than 7 million copies of the Belgariad and Malloreon series alone by 1995, with another 1.5 million copies sold of the combined Elenium and Tamuli trilogies. The total figure (incorporating almost twenty years of additional sales and his later Belgariad prequels and other books) has now passed 18 million. F. Paul Wilson is the author of numerous SF and supernatural-tinged thrillers, the best-known of which is the Repairman Jack series. Australian writer John Flanagan is the author of the successful Ranger's Apprentice and Brotherband series of adventure novels for youngsters. More than 6.5 million copies of the Maze Runner series have been sold. Another outdated figure, based on her 2 million sales for Bantam and another million or so in the UK and Commonwealth territories. Counting the several novels published since and her successful work as Megan Lindholm, the true figure is likely to be much higher than this. The above figure is from 2004 plus the recent revelation he has sold over half a million copies of the Commonwealth books alone in the USA, so it's likely to be extremely inaccurate. Hamilton may have well sold twice or more this amount. Hamilton remains the UK's biggest-selling SF author, and his US profile has grown significantly in the last decade as well. Kim Harrison has sold 2.5 million copies of the Hollows books. A mega-seller from the off, The Name of the Wind and The Wise Man's Fear (along with several novellas) have sold over 2 million copies with almost 500,000 sales in the UK alone. Deborah Harkness has sold 2 million copies of A Discovery of Witches and Shadow of Night combined. Ed Greenwood is the creator of the Forgotten Realms fantasy world, the biggest-selling and most popular shared fantasy world ever created. He has sold 1 million copies of his debut novel, Spellfire, alone. Sales of his many later novels have amounted to more. Becca Fitzpatrick is the author of the Hush, Hush series about fallen angels. Erikson's publishers announced that his books had sold 1 million copies worldwide with the publication of The Crippled God. With another book published since then and sales of the older books growing, it's likely now a lot more than this. According to Overlook Books' PR copy for The White Luck Warrior, Bakker's four previous fantasy novels had sold over 125,000 copies for them by 2011. For a very small American publishing house, that's not actually too bad. This figure also does not include Bakker's Canadian sales from Penguin or British/Commonwealth sales from Orbit (and Orbit report that they are very happy with Bakker's performance for them), or American sales from fans opting for one of the other editions. A recent Canadian article suggests the true figure is around 1 million copies (in thirteen years), which is reasonably credible). Mark Lawrence has been a big success story, shifting over half a million copies of his Thorns trilogy in just four years. One of the most famous SFF authors of all time, Octavia Butler has sold half a million copies of her novel Kindred by itself. Ben Aaronovitch has half a million copies of his Rivers of London series. Daniel Abraham has sold more than half a million copies of his Expanse SF series, co-written with Ty Franck under the name James S.A. Corey. Abraham's considerable solo work will have added significantly to this. Expect sales to increase when the TV series arrives later in 2015. The other half of gestalt writing entity James S.A. Corey (with Daniel Abraham), Franck's Expanse series has sold over half a million copies. Expect sales to increase when the TV series arrives later in 2015. Richard Morgan (aka Richard K. Morgan in the US) had sold over 150,000 copies of his Takeshi Kovacs trilogy in the UK alone by the time the final book in the series was published. No more recent figures are available, but will be significantly higher. As of April 2014, Blood Song had sold 100,000 printed copies and well over 30,000 self-published copies. Also known as David Farland, Wolverton has sold over 100,000 copies of his Star Wars novels and his Runelords fantasy series in the UK alone. John Scalzi had sold just under 80,000 copies of Redshirts alone in the latter half of 2012. His other books will total vastly more than this figure. The Twilight Reign series has sold 75,000 copies. Orbit SF author Michael Cobley has sold over 70,000 copies of his Shadowkings and Humanity's Fire SF novels in ebook alone. The total figure will be significantly higher. By October 2013, Myke Cole had sold over 40,000 copies of his Shadow Ops series. Anne Leckie's award-festooned SF debut Ancillary Justice had sold about 30,000 copies in its first year according to the author, pretty good for a paperback original SF debut. Expect to see figures skyrocket now the awards are in and the sequel is out. Kameron Hurley is a strong and high-profile new voice in SF, although her initial Bel Dame Apocrypha trilogy suffered from low sales. However, her new novel Mirror Empire has been a much bigger success and her increasing profile and recent awards are helping shift more books. And what do we learn when Robin Hobb is 93 and Stephanie Meyer is 6? That great books don't sell as well as pulp... And of course that sales /= quality. It will always be the case I suppose, in all mediums. No John Scalzi on this list? That's surprising, considering his lofty status at Tor. Cheers for the update of the list - I've closed the old thread on chronicles and linked to this post in a new one. Hard to believe that Ray Bradbury is so low at #68. That just doesn't sound right. I'm sure if Tairy released a more recent number he would easily be #1 on this list but he just doesn't want to make the other authors feel bad. Thanks for doing this! This is the sort of private project that is realy useful to everyone to have online, but that never seems to get enough overt thanks! I'm going to take all this with a pinch of salt. I'm pretty sure King is no. 1. As popular as Harry Potter is, his body of work beat Rowling's by a healthy margin. Rowling was a monstrous worldwide phenomenon in King's league before the films starting coming out. When the films started appearing, the book sales rocketed through the stratosphere and left even King in the dust. The most telling point in Rowling's favour (aside from the published sales data) is that Rowling was a billionaire, before she gave away a large chunk of her fortune to charity. King's new worth is estimated at around a fifth of that at best. I am very surprised and pleased to see Lawhead on the list. Higher than some guys I'd have not guessed like Rothfuss. I grew up in a Christian (and am still a believer) in a fantasy and scifi loving family (well, my mom). I read a lot of the classics, but also a ton of Christian fantasy authors. Stephen Lawhead was always my favourite. As I grew up I moved on to new favourites - Erikson, Alastair Reynolds, Butcher, Cook, Kay - I was extremely pleased that, as I re-read my favourite Lawhead books, that it held up in comparison to any other author. This was extremely rare in looking back at the books I used to read...most have gone into storage or the used book store. The Song of Albion trilogy is still one of the best series I've ever read. Hi Adam, are you going to update the list to add the new Bakker figure or are you going to wait until the next major update? More importantly, do you find the figure even credible considering the rumors about Bakker's publishers dropping him? Bakker's sales in Canada have been pretty risible, but Orbit have always reported that his sales in the UK and the other Commonwealth territories have been very strong and he's been pretty big for Overlook in the US, shifting 200,000+ copies for a fairly small press. So 1 million worldwide in fourteen years I think is reasonably credible. And yes, there will be an update in the nearish future. Here are some corrections to a few these figures, with a citation. Ransom Riggs has sold over 2.55 million, according to his publisher. Seth Grahame-Smith has sold at least 1.5 million copies of Pride and Predjudice and Zombies alone. Bookscan suggests otherwise for Bakker. His last book only sold 1461 copies. It's also easy enough to pull down the Bookscan UK reports for him, and those aren't adding up to your stated figures. So what gives? No Tim Powers? I would think "On Stranger Tides" would have enough sales on the back of the Disney (loose) adaptation to get him in the list alone. Any guesses on Jack Vance? Do you have the 2016 list available yet, if not, any idea when you might? A big update is way overdue at this stage, and will come as soon as I can get around to it. Hopefully soon. Glen Cook is far higher on the list than John Scalzi. Now I can sleep well at night as all is right with the world. I did not see Lemony Snicket aka Daniel Handler?? I read that he has sold over 50 mil. Any plans to update this list? Very interesting indeed. Thanks. Ben Aaronovitch has sold 2 million copies of his Peter Grant RIVERS OF LONDON novels worldwide. Sheri S. Tepper is a great writer. I don't see her on the list. She should be there. I forgot about this guy, used to live his books when I was little! Patterson has written some techno-thrillers but not really any overt works of science fiction or fantasy. The number of Patterson's books which are ghost-written by other writers is also exceptionally high, and they are not always credited. Combined, those two factors make it difficult to put him on the list with any accuracy. L. Ron Hubbard? Over 4 million copies of Battlefield Earth alone and a reported 49 million copies of his fiction works sold--not including his non-fiction works.